Miami is a wonderful city full of light, color and joy, which also has sites of great beauty and a magnificent coastline of golden beaches and crystal blue waters. Chicago is an ideal destination to learn more prominent and relevant American architecture in U.S. and is therefore it called as "The cradle of the architects." After the great fire of October 1871, the principal architects of the late nineteenth century, such as: Louis Sullivan, John Osdel, Mies van der Rohe, Frank Lloyd William Jenney and Wrigh, were responsible for reviving the city with novel characterized by buildings of steel beams, concrete slabs and iron cages. This is the new Chicago, the city of skyscrapers that combine with harmony between large cultural, leisure and entertainment, a multitude of parks, forests, rivers, the great Lake Michigan, a history full of legends and a form of typical American life. Because of its history and characteristics, Chicago has become an open air museum, full of architectural treasures, beginning with the Michigan Avenue Bridge. The bridge across the Chicago River while offering the visitor, through its four pillars, the history of the city: its discovery, its establishment, the Slaughter of 1812 and the Great Fire. On transferring the route begins giant skyscrapers, most notably for its importance to the American city: the Wacker Drive, built by Pedersen in 1980 and whose design reflects the curvature of the river through mirrored glass reflected in the water, sky and the image of Chicago Water Tower, the only one who survived the great fire of 1871, with over 100 shops and boutiques which, interestingly, is located next to the John Hancock Tower, the fifth tallest building world and one of the most modern in the city. Moreover, since its 94th floor Chicago can discover up to 100 kilometers away. Other notable buildings in Chicago are: Wrigley, Spanish Renaissance style, notable for its similarity to the Tower of the Giralda in Seville and the giant clock that elevates the building, the Marina City, characterized by its two towers, " The Ears ", with its 62 floors becomes the highest concrete structure in the city, the Chicago Tribune Tower, built in 1925 Gothic-Renaissance style, showing reliefs on the walls of famous places like the Taj Mahal, the Great Pyramids or the Westminster Abbey, the Merchandise Mart, the largest mall in the world, dating from 1930, the James R. Thompson Center, inaugurated by Governor Thompson in 1985. It is called the first building of the century and is worth visiting just for the views of the sky offering its roof or its glass elevators. Similarly, if you're in Chicago is essential to visit the Sears Tower, with its 103 apartments is the second tallest building in the world. The building has an observatory, the Skydeck, which offers a 360 °. And finally, among many other striking and majestic building is the Chicago Cultural Center, considered one of the most comprehensive arts showcases in the United States and one of the ten most popular attractions in the city. Built in the 77 East Randolph in 1897 and since then is considered a symbol of Chicago's architectural heritage. This huge block is the tourist office in Chicago and the largest Tiffany dome in the world. Besides architecture, Chicago has corners worthy of admiration, as the Navy Pier, dedicated in honor of the sailors who participated in the First World War. It was remodeled in 1994 to become a recreational pier where tourists can enjoy restaurants, shopping centers, a family pavilion for children and outdoor gardens with sculptures dresses by famous artists. It is popular for its Wheel of Fortune, the Chicago Shakespeare Theater or the Children's Museum of Chicago. Another spring, which once was a commercial shipment, is the North Pier. Now the old building has been converted into a place full of attractions and shops. But undoubtedly the ideal area to reflect the commercial life of Chicago's The Loop, located on State Street, where shops are located the famous Marshall Field's and Carson Pirie Scott and Company. This is the historic heart and commercial district of Chicago, whose 2.5 km square of the centenarians are embellished elevated trains. Other commercial sites are full of glamor: the Magnificent Mile, the famous shopping street of the city, laden with flowers, which extends throughout the North Michigan Avenue shops, malls and boutiques, or the Chicago Place. 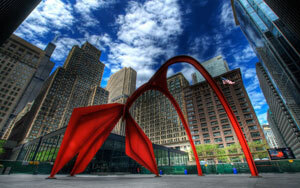 Fourth of art is also apparent in every corner of Chicago and the buildings we offer outdoor sculptures, such as Alexander Calder's Universe Sears Tower building, or the Flamingo of the three buildings of Van der Rohe. Although the most significant may be Four Seasons, a representation of scenes of Chicago between naturalistic images, created by the Russian Marc Chagall, and Picasso Untitled, 15 meters high and 160 tons, which was donated by the sculptor to the city . Of course, Chicago also offers great museums dedicated to the arts, science, natural history and culture, among the highlights: the lions, Art Institute of Chicago, dedicated Impressionism, the Field Museum of Natural History and the Museum of Science and Industry, where visitors can learn by interacting with all its attractions and exhibitions. Along with its buildings, museums and shopping, Chicago is also famous for its parks and outdoor areas. And it has more than 2600 hectares of parks, such as: Grant Park, where concerts are held outside of jazz, blues or gospels, the Lincoln Park, famous for its gardens and flower displays, the park Goals, found in the heart of the city, inside which you can enjoy the pleasure of skating in a popular ice rink or go to cabarets and plays, and Oak Park, a residential area built on the campus of the University of Chicago, which symbolizes the origin and Prairie school completion: the most influential figure in the history of American architecture. And lastly, to see Chicago in all its essence is mandatory to take a trip down the Chicago River and Lake Michigan up to one of the boats of Michigan Tower Bridge. In all routes, the most popular and spectacular is offered by the "Chicago lit" and discovering the bustling port of Monroe, Montrose and Burnham or Oak Street Beach. Tourism: Over 60 million international tourists visit USA each year. Time zone: (UTC−5 to −10) Summer (DST) (UTC−4 to −10). Currency: United States dollar ($) (USD).